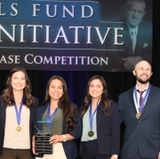 A team of University of New Mexico students took first place in the Daniels Fund Ethics Initiative New Mexico Case Competition recently. The competition was hosted by UNM’s Anderson School of Management and New Mexico State University in Albuquerque. The winning team included: Alex Abbate, Justin Fouts, Houston Hilbun, Tyler Masterson and Sydney Sivils, all students at the UNM Anderson School. They competed against student teams from NMSU, New Mexico Military Institute and Eastern New Mexico University. The teams were challenged with a hypothetical situation that required them to come up with a response to a dilemma and prepare a presentation for a group of judges coached by Barney Rosenberg, vice president of Ethics and Business Conduct for Meggitt, PLC, a global defense contractor. Rosenberg created the highly challenging role play case for the students. The judging team included: Mark Meiering, J.D. ; Tracy Marshall, Northwestern Mutual; Tony Martinez, Molina Health; and JoLou Trujillo-Ottino, Media Works Advertising Specialties. 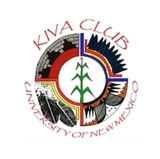 The competition, aimed at cultivating more ethical behavior in business by working with students in New Mexico institutions of higher education, is funded through the Daniels Fund, which seeks to promote higher ethical standards in young people and to improve principle-based ethics education. The fund is a private foundation established by cable television pioneer Bill Daniels. Both UNM and NMSU received $1.25 million from the Daniels Fund along with six other universities in Colorado, Utah, and Wyoming. Each school in the consortium teaches ethics and promotes principle based ethics both on and off campus. UNM offers a teaching business ethics online certificate course, free of charge, to professors from across New Mexico as a part of the grant. This is the second ethics competition supported by the grant. 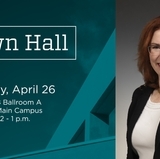 For more information, visit: Daniels Fund at UNM.